"First came the shoulder pads. Next, ruffles on semi-formal dresses. Finally, Mindy Kaling, star and producer of "The Office," made an appearance at the Emmy Awards this past Sunday in a retro-style prom gown, and we can't deny it any longer - the '80s are back and influencing formal dresses everywhere. First came the shoulder pads. Next, ruffles on semi-formal dresses. Finally, Mindy Kaling, star and producer of "The Office," made an appearance at the Emmy Awards recently in a retro-style prom gown, and we can't deny it any longer - the '80s are back and influencing formal dresses everywhere. Of course, this is nothing of which women should be frightened. In fact, the infamous decade, which was responsible for loud, boisterous florescent colors and out-of-this-world hairdos, boasted some of the most totally awesome styles the world has ever seen. Kaling's dress transcended this idea. The adorable lady showed off a black strapless number that featured scores of tulle and satin. The piece, which fell to her knees, was also as poofy as can be. While women may want to tread carefully with this look, it goes without saying that those 10 special years were jam-packed with pretty pink gowns and dresses that cannot - and should not - be forgotten. Embrace your inner '80s child when searching for dresses and see what happens." 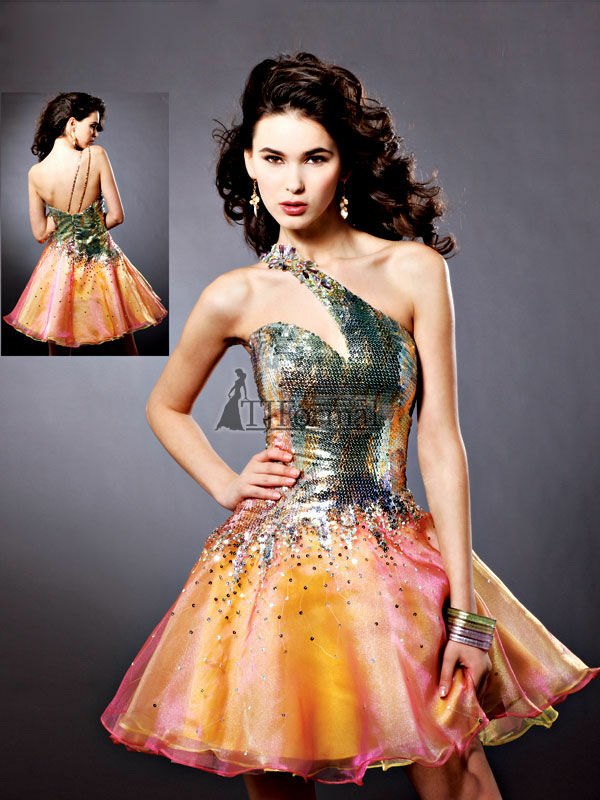 TJ Formal has some great choices for 80's inspired dresses! I saw so many homecoming dresses this year that were short. Really, really cute! Gorgeous dresses! Thanks for sharing these beautiful collection. I like the first one black dress, superb! I would like to have made the same for me.